Miami Beach vacations can be expensive and finding ways to get good deals is appreciated by our visitors. Now there is an easy way you can receive great deals on products, dining, entertainment, services and more through Miami discount coupons. There are numerous websites and social group buying sites that now offer daily online Miami discount coupons. It’s easy to subscribe; simply register your name and email with one or more of websites and receive great deals and coupons every day that you may use during your Miami Beach vacation. Many local businesses in Miami are participating by offering more than 50% off on meals, lodging, hair salons, spas, boat rentals and more. These buying sites on the internet provided members with tons of savings with everything from Miami Beach vacations to various activities in Miami. 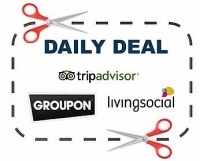 The most popular and recognizable site is Groupon, one of the first sites to offer Miami discount coupons. Since then many other websites have duplicated this idea and have popped up all over the internet. Our clients will find hereunder a list of website they may subscribe to receive great deals. Different deals are being offered on a daily basis and they are limited in time, users can buy those “deals and use them later.